Swimming Pools are often the centerpiece of any great backyard. It’s where the kids splash and play all day and where the adults sit and relax in the evening. Nothing beats the sound of moving water on a warm summer night. Enjoying the company of friends and family for a Sunday cookout, your pool is always the focal point and a great source of entertainment and enjoyment! 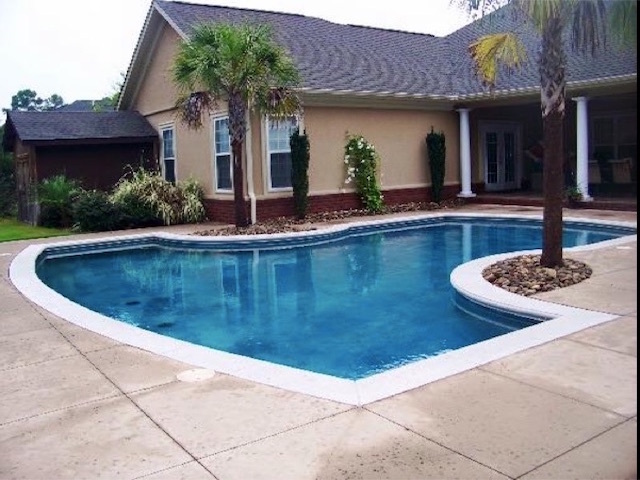 Did you ever notice that when you visit homes with a pool that no two pools look alike? That’s because there’s a pool size and shape for every taste and every backyard. It could be a fiberglass pool, a concrete pool or a vinyl liner pool. Everybody’s situation is different, weather it be budget, personal preference or what works best for a particular backyard. There’s a swimming pool for everybody. Please feel free to explore this website for the kind of swimming pool that fits you. If you see something you like or have any questions contact us and we’ll be happy to walk you through the process. It’s our goal to make your backyard everything you ever wanted it to be. It’s your backyard…use it, live it, love it!